54 years old; Married, two adult children; High school education; Works Monday – Friday, 8:00 am – 5:00 pm. 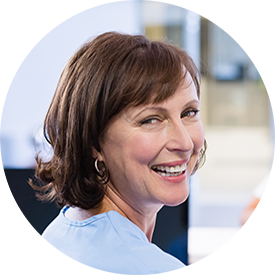 As the person at the front desk at the office of two orthopedists and a physical therapist, Fran is the face of the practice. She’s worked at the front desk of physicians’ offices for 18 years and is a skilled communicator. Handling a wide variety of tasks – from scheduling appointments and handling patient communication (including complaints), to working with insurance companies and other industry contacts, to overseeing the supply situation and physical state of the office – she helps everyone who is part of the care process. Her main focus is the patient. She does what is needed for the patient to thrive and the practice to succeed. Fran feels like her skills are hard to quantify since she didn’t go to medical school. But without her, the physicians would be spending a lot of time waiting around for patients or on the phone with pharmacists and labs, and the practice would be out of rubber gloves. Fran wishes that her salary reflected the value of the things she does to make the practice function. In addition to being a good communicator with patients, physicians, pharmacists, suppliers/vendors and insurance company staff, Fran is a strong problem solver, diffuser, diplomat and negotiator. She has strong administrative computer skills – Word, Outlook, scheduling/contact software, and specialized hardware for scanning credit cards and insurance cards. She’s also proud of her hard-won knowledge about how to work with insurance companies. Not have patients get upset with or yell at me today. Don’t let the incoming faxes pile up. Call copier repairperson (need to keep the equipment up and running). Follow up on denied claims. Earn a certificate in an additional set of skills to potentially advance career. Save enough money to retire at age 68 without too much worry. Keep the practice running smoothly through transitions of clinical staff. Low pay – need a raise. Patients don’t pay their bills on time and expect me to be able to reduce their bill. The physicians do not listen to my ideas or treat me as a skilled team member. System is slow; I have to keep telling people on the phone to pause. I am asked to do things that other team members should be doing. Doctors ask me to look up diagnosis codes; but I am neither a doctor nor a coder. Insurance companies always deny claims in September and October. I have too much information to enter while patients are waiting for me to finish. The fonts on my screens are extremely hard to read. I don’t know how to get useful information and have to rely on others to get it for me.